Mad Pride is an international movement created by psychiatric survivors, consumers, people labeled “mentally ill” — all that proudly reclaim the words mad & crazy, and those in solidarity with us. 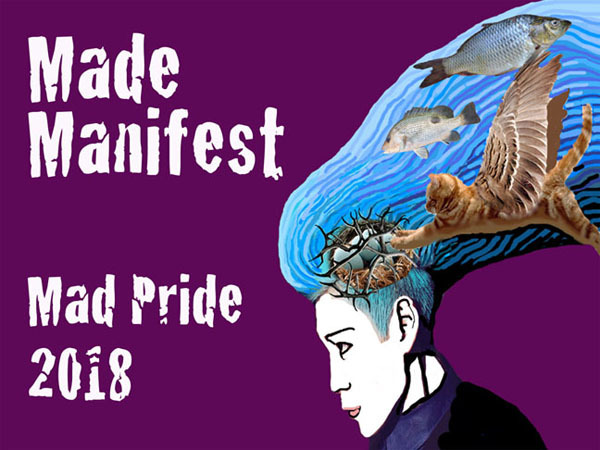 This year artists and allies in our neighbourhood have come together to collaborate on poetics, design posters, banners and signs, in support of Mad Pride 2018. The creation of such collaborative, ephemeral and portable works is a long-standing tradition of many an uprising, a beloved staple of political actions throughout history. Serving as a bridge between the personal and the political, signs and banners can be manifestations of inner struggles externalized and made public. The artwork in this exhibition proclaims reclamation and offers an opportunity to reimagine or relinquish systems that continue to harm. Made Manifest is a site of safekeeping for the living words and expressions entrusted to it, for the moment; until it’s time for them to spill out through the gallery’s doors and into the busy street. We are harnessing amazing feats of madness in an evening of celebration as part of International Mad Pride Day. Beginning with a parade led by the fabulous Carnival Band and culminating with an evening of entertainment. You are invited to join the revelry. We’ll travel down Hastings to the Carnegie and back again before arriving at the Lost and Found Cafe where we’ll keep the party going with our Annual Mad Pride Cabaret.